In 2014, I wrote an article entitled “Malta: A silent pathway towards a cultural boom?” in which I attempted to highlight some facts and figures clearly indicating a potentially successful new case study in the field of cultural development. A few years later, the evidence has proven to be accurate and the archipelago of Malta has followed its road map towards deep cultural transformation. A timely, fortunate and strategic sequence of events has been played out in its favour: The long-term program of Valletta 2018 European Capital of Culture; the cultural agenda related to the coordination of the Presidency of the Council of the European Union during the first semester of 2017; the hosting of multiple international cultural meetings and events, such as the 7th World Summit on Arts and Culture and the Anna Lindh Forum, both held in Valletta in October 2016; the consolidation of public cultural bodies, particularly the Arts Council Malta; the construction of new cultural infrastructures, including MUŻA and the Valletta Design Cluster; and the development of diverse programmes and projects in the field of contemporary art and culture –within the country and beyond– are primary examples characterizing this momentum and driving the cultural transformation. Suddenly Malta’s position within global cultural geography began changing, quickly moving from the distant periphery to the so-called centre. A geographical metaphor –worth mentioning– that does not wish to valorize the central over the peripheral, but intends to highlight the current Maltese shift towards greater presence and visibility in international programmes as well as the restructuring of its cultural ecosystem that, nevertheless, maintains its local peculiarities. This shift did not occur by chance, but emerges from a deep analysis of the cultural sector, a study of its shortcomings and lacks and, above all, from a dedicated focus on building a national cultural policy and a strategic vision for the future. The first National Cultural Policy document, finalised and released in 2011; the National Strategy for the Cultural and Creative Industries, drawn up in 2012; and the Create 2020 Strategy, launched in December 2015 by the Arts Council Malta, illustrate the essential passages of this serious path towards organizing, structuring and improving the needs and visions of the entire cultural sector. Each document nurtured the next, and the inclusive and participatory approach (e.g. 330 people contributed towards shaping the 2020 strategy) along with the constant suggestions for establishing international collaborations, encouraged the development of this on-going process of cultural examination, production and change. One of the main strengths of this process is its ability to imagine and establish new goals and objectives towards 2020 and beyond, without considering Valletta 2018-ECoC solely as a point of arrival, but rather as a point of transition. Nevertheless, recent political turmoil in the archipelago has shaken the cultural sector, proving the delicacy of this equilibrium and the demanding and challenging nature of building a long-term vision that can quickly collapse under sudden political changes. Although art and culture should maintain safety and sanity through their own autonomy, independence and freedom, changes in the political sphere can highly affect and impact the development of neutral mechanisms and tools designed to benefit the whole sector. However, the cultural achievements and progress in Malta are keeping their pace, without –apparently– succumbing to the dynamics of political fluctuations and power plays. The productive synergies between the Arts Council Malta, the Valletta 2018 Foundation, the Ministry of Culture (Ministry for Justice, Culture and Local Government), the numerous local councils and the distinct cultural and educational institutions in the country, represent an effective model. Beyond healthy criticism, which is both necessary and constructive, it is useful to encourage a wide range of participation, within the local cultural sector and in dialogue with international professionals, in order to build a new shared cultural context. Supporting younger and experimental initiatives, as well as selecting professional figures in a transparent way - for their skills and experience, rather than assessing political colours and affinities - are key issues for consolidating this path of evolution and transformation and providing real options for a sustainable future. In any case, there is no doubt that the contemporary cultural situation of Malta is experiencing a moment of extreme stimulation and effervescence. Beyond specific projects, which will be examined in the following articles, numerous elements and ideas are determining this current development: the importance of a people-centred approach; emphasis on community; a focus on international and transnational cooperation; and the assurance of long-term sustainability of the cultural sector, are some of the most significant. The national-community approach, headed by the MUŻA project, and evident in all the current cultural strategies and policies of the main Maltese actors, constitutes a meaningful characteristic of this new course. Through the various in-depth articles concerning this specific issue and through the direct voices of some of the protagonists and observers of the abovementioned cultural process, we can get an overview of the diverse initiatives, opportunities, challenges and visions that are currently changing the cultural ecosystem of the Maltese archipelago. Karsten Xuereb, Executive Director of Valletta 2018, contributes with a text dealing with the intricacies of economy, cultural policies, cultural production, and their relationship and impact on society. He presents a subtle analysis of the challenges and contradictions existing within these complex relationships, and clearly within the ECoC programme. Sandro Debono, project leader of MUŻA, reflects on the changes that need to be addressed in the museum and cultural sector in general, and particularly within the MUŻA experience. According to Debono, the new polyphonic models and the change of narratives and methodologies that require greater community participation are central elements for the establishment of the next cultural ecosystem. Researcher and curator, Katya Micallef presents an overview on the development of contemporary art in Malta, focusing particularly on the experience and role of the START art group. Artist, curator and founding director of Blitz, Alexandra Pace, has accepted my invitation to engage in an interview-conversation focused on the history, current vision and role of Blitz, a fascinating artist-run space located in the heart of Valletta. Artist and curator, Bettina Hutschek gives voice to the FRAGMENTA experience, highlighting the peculiarities and ambiguities of public space in Malta, and the function and role of art within this context. 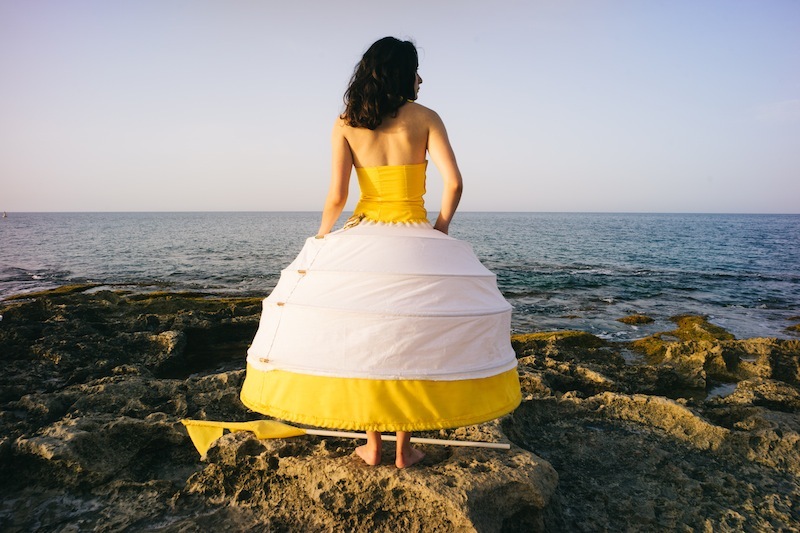 Ann Laenen, Meeting Point Strand Coordinator at Valletta 2018, talks about the diverse Artist-in-Residence programmes that are currently being developed in the archipelago. Editor and writer, Veronica Stivala conducts a meaningful analysis of the lack of critical writing in Malta. Her text focuses on the need to urgently address this issue, highlighting the possible causes of this shortage. Pixel Malta Arts Festival 2015. MIAF Matthew Mirabelli.